Blackbird Presents, Mark Rothbaum, and Keith Wortman are proud to announce the concert event of the year… Willie: Life & Songs Of An American Outlaw, A Willie Nelson All-Star Concert Celebration. This once-in-a-lifetime concert will take place Saturday, January 12, 2019 at 7 pm CT at the Bridgestone Arena in Nashville, TN. This historic event will honor living legend Willie Nelson and feature his greatest hits performed by today’s biggest superstars. This major event will be filmed and recorded for a major broadcast special slated to air on A&E Network in 2019. 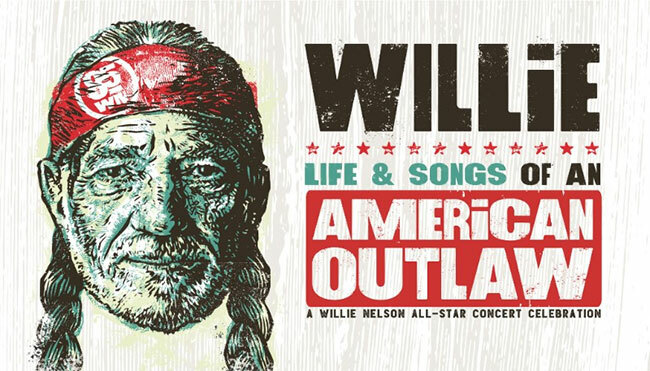 Willie: Life & Songs Of An American Outlaw will feature star-studded performances by Willie Nelson, Alison Krauss, The Avett Brothers, George Strait, Jack Johnson, John Mellencamp, Kris Kristofferson, Lee Ann Womack, Lyle Lovett, Norah Jones and The Little Willies, Sheryl Crow, Susan Tedeschi & Derek Trucks, and Vince Gill. Additional artists will be announced in the coming weeks, along with surprise guests and unforgettable collaborations to be revealed at the show. Tickets go on sale Monday, November 12th at 10 am CT online at LiveNation.com, by phone at 800-745-3000, and the Bridgestone Arena box office. VIP packages including great seats and exclusive merchandise will be available. Citi is the official pre-sale credit card of Willie: Life & Songs Of An American Outlaw. As such, Citi card members will have access to purchase pre-sale tickets beginning Thursday, November 8th at 10 am CT until Sunday, November 11th at 10 pm CT through Citi’s Private Pass program. In his 85th year, Willie Nelson is more prolific than ever. In 2018 alone, he’s released his 67th studio album, Last Man Standing, a stirring collection of his favorite Sinatra songs, My Way, and headlined the largest touring festival in North America, Outlaw Music Festival. Nelson is America’s music hero. It’s hard to put into words what he means to singers, songwriters, musicians, and people all over the world. Through life’s ups and downs, heartbreaks and rewards, Nelson and his songs have been a dear and constant friend to all of us. He’s a trusted father figure to millions of Americans by lifting them up through Farm Aid and his annual July 4th Picnic. He’s the clear inspiration for dozens of today’s biggest music stars from all genres of music.